Deborah Hardoon introduces our new report, ‘An Economy for the 99%‘ and argues that extreme inequality and a crisis in economics have created the appetite for an alternative vision for the future. 8 billionaires own the same wealth was the poorest 3.6 billion people. Credit: Oxfam. Nerd Alert. As a student of economics, I always found the technical aspects of the subject deeply satisfying. Getting to the ‘right’ answer using algebra and statistics, solving ‘proofs’ and finding that stable equilibrium. Bliss. But what’s always been more fascinating is that economics is a social science: it’s about real places, human behaviours, complex environments and governance systems. This is messy and diverse, so in order to derive textbook-ready models, principles and theorems, economics has had to cut through the mess to make simple, standard assumptions about the world we live in. ‘People’, with different characters, abilities and opportunities are replaced by identical utility-maximising individuals. Echo chambers, propaganda and manipulative marketing are replaced by the assumption that all consumers and businesses have perfect information about each other. Put the messiness back in and the models soon start to look a whole lot less satisfying. Economic growth doesn’t always trickle down to benefit the poorest. When people receive higher wages, they tend not to work fewer hours (as the backward-bendinglabour supply curve would suggest). Production is not just a function of capital and labour, but also environmental resources and impacts, not to mention unpaid labour. And of course, hardly any economists saw the financial crisis coming. The reputation of the ‘dismal science‘ is facing further derision. Andy Haldane, chief economist at the Bank of England, recently said that economic forecasting was in crisis. But before we throw the baby out with the bathwater (does anyone really do that?) and deem all economists irrelevant and useless, I think it helps to be more specific about the ‘problem’ with economics and economists today. So let’s start with why at least some economics deserves the current kicking. If we look at economic orthodoxy, there is a lot that Oxfam can take aim at. Take the captain of economic measures, GDP and GDP growth. As a measure, it completely ignores who gets what from the economy – people living in poverty can be netted off by high incomes elsewhere. It is indifferent to the kind of production (cigarettes or vegetables) that’s growing, or what’s happening to the environment. 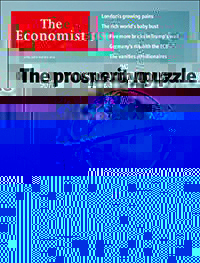 Yet it remains at the forefront of economic decision making and it’s the first economic indicator listed in the back of The Economist every week – despite a recent (April 2016) special edition that highlighted its flaws and limitations. Neoliberal economics promotes markets as the most efficient way to allocate resources, as the forces of supply and demand fight it out, free from distorting government intervention, and the most efficient price and output is achieved. But unfettered ‘markets’ also allow medicines to be priced out of reach of the most vulnerable, bankers to take risks which destabilise the global economy, more investments in dirty energy at a time when we know our environment can’t handle the impacts. But despite the flak that economics is getting today, I still think it’s a pretty exciting, relevant and dynamic subject- if you look outside that orthodoxy. Innovative academic institutions and think tanks are promoting new ways of using economics to understand our current reality: a reality that includes a warming climate, societies that are built on patriarchy, and value that can’t be monetised. Degrowth, alternative economics and new economic paradigms – the ideas are flowing, the mutations are proliferating. Students are challenging their professors in the rethinking economics movement. Last month, 13 of the world’s leading economists, including Nobel laureate Joseph Stiglitz and four former chief economists of the World Bank, released a statement that said: ‘It is now evident that some of the recommendations of more traditional economics were not valid’, and proposed an alternative set of principles for organising economies. In 2012, Oxfam’s Kate Raworth published her ideas on ‘doughnut economics‘; how we can meet people’s basic needs while respecting the planet’s boundaries. She left Oxfam to turn her ideas into a book, which is out in April – it could be very influential. Last week my colleague Katherine Trebeck, who has been exploring new economic paradigms for some years, published (with two other authors) Tackling Timorous Economics, using Scotland as an example but with much wider application of how to manage our economies better. And today we published ‘An Economy for the 99%‘, timed to coincide with the week that the super-rich and powerful convene in Davos for the annual World Economic Forum. By way of a killer stat that is great clickbait, this report highlights today’s extreme levels of economic inequality: eight men now have the same amount of wealth as the bottom half of the world’s population. Get beyond the headline and you will read our analysis of how the world has got to such a perverse, unequal and unfair situation. We unpack the assumptions on which governments, businesses and individuals base decisions, finding them to be false and driving our societies – and our planet – off a cliff.